Oh, Instagram! What a tangled web you have got us all wrapped up in! You have heard me chat about Instagram on Merriweather Council podcast before, and today’s episode is just another stab at trying to make sense of ye olde Instagram! 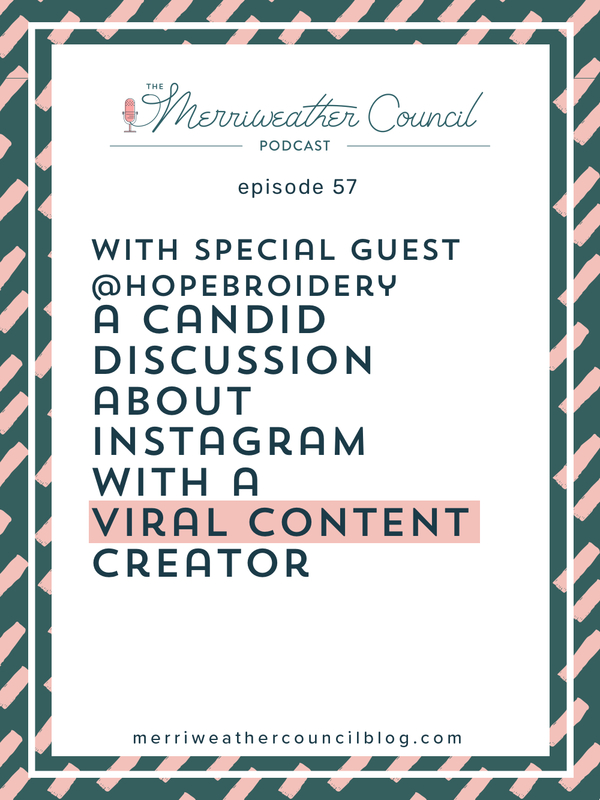 On today’s episode I’m chatting with Hope Brasfield of @hopebroidery about her experience going viral, creating content, using Instagram stories, social strategy and more! Hope was using Instagram in its purest form when her account went viral and she gained 10k+ followers overnight (literally.) As an IG purist, Hope was using her account to simply share about her embroidery hobby. But fast forward to now and she’s making solid money leveraging the power of her Instagram account. I know you will love this episode as both Hope and I share personal experiences with Instagram including being frustrated by it! Even she, with 170k+ followers, has moment of frustration with the platform. Very refreshing to hear actually! Tune in to hear more and be sure to Check out Hope’s feed here!